How many before dusted and done. Never dusted, never done, for the one. It is an honour and joy for me to guest blog at Scottishmomus. Anne-Marie is very dear to me, and to think that we have not even met up in person (yet). But we have met numerous times over the net, via emails and between each blog post. Our friendship blossomed through our mutual love for words, and passion for humanity. Technology has enabled us to find each other. With it, I have also found a beautiful soul sister in Anne-Marie. For this and more, I am truly grateful. Technology can truly be used for the greater good when we make it so. I’ve witnessed how this wonderful blogging community has evolved over time, making it possible for writers and friends from all around the world to connect. I get to marvel at each unique talent at work (and play) in the process. The blogging and writing arena is no different than the real world. It is not always smooth sailing, but there is always sparks of brilliance. 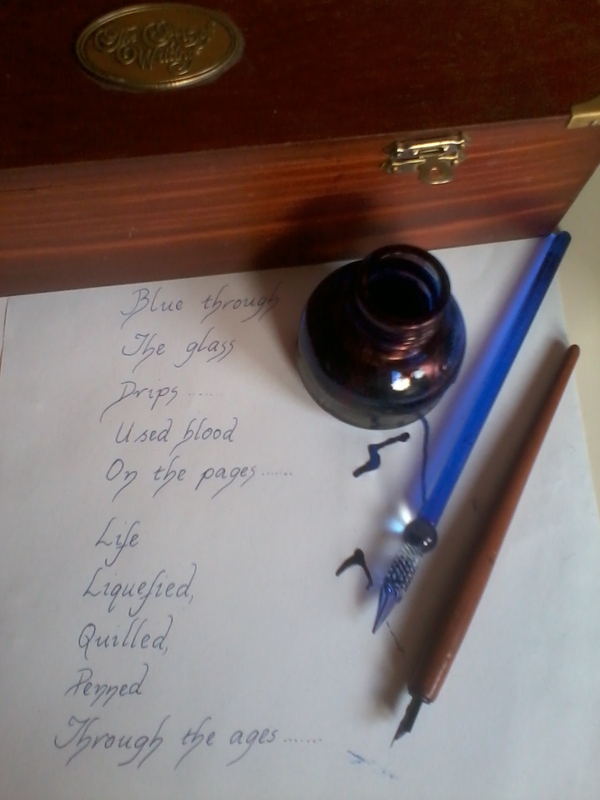 There are times when the pen bleeds, but nothing comes forth. No words would adorn the page. No verses could spell out the emotions that lay buried. But there are times when our hearts open up, and then the pen drips boundlessly as if by magic, from one page to the next – eager to fill up the emptiness, staining that white papery sheet with love, pain, happiness, sadness, hopes, fears, dreams and whatever else that lies beyond. 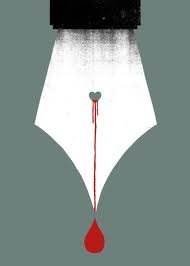 If you can write, write. If you can draw, please draw. If you can sing, please drown the noise with your melodious voice. Whatever it is that you are good at doing, or enjoy doing – just please do it. Don’t let your fears hold you back. So, channel all your emotions and creativity into form. Bring them to life, and share with the world. We are all better because of it. Your talent is a gift. It adds value to our perspectives, and enriches our humanity. So, please don’t stop. And if you have yet to start, please choose your “medium” and begin. As we await for Anne-Marie to complete her novel, may each of us continue to colour the world with our own magical “wand”. I nipped home from school at lunch time today to pick up a ‘princess’ dress. There and back inside 45 minutes. And so worth the rush. You see, one of the schools I teach in was having a dress rehearsal for the Christmas school panto – an adaptation of Cinderella. A member of staff mentioned earlier in the morning that one girl was without a costume. She had been off school and was not aware that she had to bring a dress in with her today. And she had nothing suitable. Just like the real Cinderella. I had no idea who the dress was for but, judging from the teacher’s description of the girl, I felt sure I would have one at home that fitted. Well, not me personally, you understand. I don’t dress up as a princess. Much. One of my daughter’s dresses. When I realised the dress was for her I was worried. This child was going to be one of the Cinderellas! I reassured myself that maybe she had a non-speaking part. Shortly after one o’clock I sat, along with all the other children and staff in the school, and watched as three classes of children aged 9-11 did their thing. They were great. K. came on in her princess dress. I was practically holding my breath. The song finished and the next scene was between K. as Cinderella and Buttons. I was blown away. My gawd, she was brilliant. This bashful child enacted her part with clarity and volume and facial expressions and movements worthy of either of the two ‘real’ pantos I’ve been at in the last few weeks. Sometimes, people think that Drama, Dance, Music, Art and P.E. are secondary in importance to the principal subjects of literacy and numeracy. Of course, the latter two are important. And I love teaching them . But, I’ve argued for years that the aesthetic and physical subjects develop areas of personality and boost confidence that helps with all areas of school life. Today, K. showed me and everyone there that there is nothing secondary or inferior in worth in the aesthetics. She was not the only one. Every child on that stage and in the choir took on roles, some of them humorous – a difficult thing to pull off- all acting and singing their hearts out. I have seen this over the years with the Expressive Arts and P.E.. The opportunity for teachers to see the children in different learning environments, using different attributes and developing their skills is an eye-opener. K., for me, was the one who really mattered most today because the difference in the before and after was so pronounced. I remembered then a conversation from the staff room of a few weeks ago where one of the teachers had commented on a quiet child who blossomed on stage. This was K.! When her parents see her tomorrow and Friday in the real show they will beam with pride. I did. Posted on December 11, 2013 February 8, 2014 Author scottishmomusCategories Life, ThoughtsTags art, confidence, dance, drama, Expressive Arts, Music, P.E., personalities, role play27 Comments on Beaming! Words jest and play with all held dear. Clowns laugh and joke and play their part. Miss and hit, such talent rare. Cruellest gift, no gift at all. All those who, for me, have no name. A patronising nod to their need. On ambrosia and nectar we feed. But obscure it so they really won’t know. Keep lack of knowledge the norm. And damn them with faintest of praise. And then, just a few. For educated man to serve. And the word serves us. Divide all people and races. Partial disclosure is really a lie. And called you his own. Fills the wound with true fear. In you, he is found. That’s probably not going to make a great title for a film. There wouldn’t be too many laughs in it either. This week past I attended the funeral Mass of a young man. Fifty-five is young when you’re fifty-two. In the last year, this is the third death of someone young that I’ve known. I wasn’t close to any of them but they had each come into my life at different points. They were each local, they were each about the same age. They each died alone. Completely alone. They had loving family. Families who cared about them and wanted to help them. They were each beyond reach of help. Two died alone at home. One ensured he would be found. They died, directly or indirectly, by their own hand. Their choices and circumstances led them to an early death. Their families grieve the loss of one they could not help, despite love reaching out to do so. One I will remember by a piece of his art that hangs on my living-room wall. Another, I will remember each day I pass her house. The last I will remember from a dance as a teen. I knew them all in better days, in a carefree past. Whatever troubles life brought to them, they were too much. Well, today, my husband and I went for a champagne afternoon tea that had been purchased last year for our silver wedding anniversary as one of the gifts from our seven gorgeous kids. The other gifts were enjoyed almost immediately. This voucher has lain for nearly a year, almost on the point of expiry. Finding the time to use it always just out of reach. We made time today to use it. For a few hours we had time for just the two of us. We reminisced, we laughed. We talked about our children – that’s inevitable. We made a few plans. Some may happen. Some may not. Our weeks unfold, one upon the other. There are glad days and gladder days. There are sad days and sadder ones still. We live, we work, we love. We reach out to each other, as a couple, as a family. And, sometimes, it is not.